Last week… wait, was it last week, or the week before? *opens browser to double check date of last blog post*…. A couple weeks ago, we told you about the trouble with our – ahem- new dishwasher, and we also posted a really yummy Lemon Sponge Loaf recipe. If you missed that recipe, be sure to check it out, but as promised we told you we’d update you on the situation with our defectively new dishwasher. Let’s just say that resolution has been slow as molasses, which incidentally is one of the ingredients in these Chips & Nibs Chocolaty Cinnamon Cookies we’re dropping today. So, what’s the problem exactly? Well, as you’ll recall the door on our dishwasher doesn’t close tightly, causing condensation to build up on the control panel. We’ve now had two service calls. Last week, a nice gentleman from a third-party service company came and installed a new lock on the door because the original lock was broken on our defectively new dishwasher. Now this doesn’t sit well with us. We paid for a new dishwasher with no defects. We also purchased a rather pricey dishwasher because we wanted one that would last. We did our research. We reviewed several models and brands. We were confident that we had made a smart purchase. What we didn’t account for were ridiculous replacement policies (apparently we have 48 hours to report defects to the manufacturer). What’s more is that we bought two. Yes, that’s right, we bought two of the same dishwasher at the same time. One was for us, and the other was a gift for a family member. So, not only did we spend a lot of money on two dishwashers, we know exactly how the dishwasher is supposed to run because the other one runs perfectly and has a very tightly sealed door that can’t be opened with a baby finger (like our defectively new dishwasher). We got lucky there, I suppose. So, where are we at? Well, the new lock on our defectively new dishwasher did nothing to solve the problem. We still get condensation building up on our control panel. We’ve called the retailer back and requested no further service calls…. We want the unit fully replaced. We are now working with the retailer to resolve this issue. That means we’ll have to update you in our next post on the resolution to this. We’re aware that we have not published the names of the brands involved in this – yet. We’re trying to give them a chance to do the right thing before we make a public case. Stay tuned! 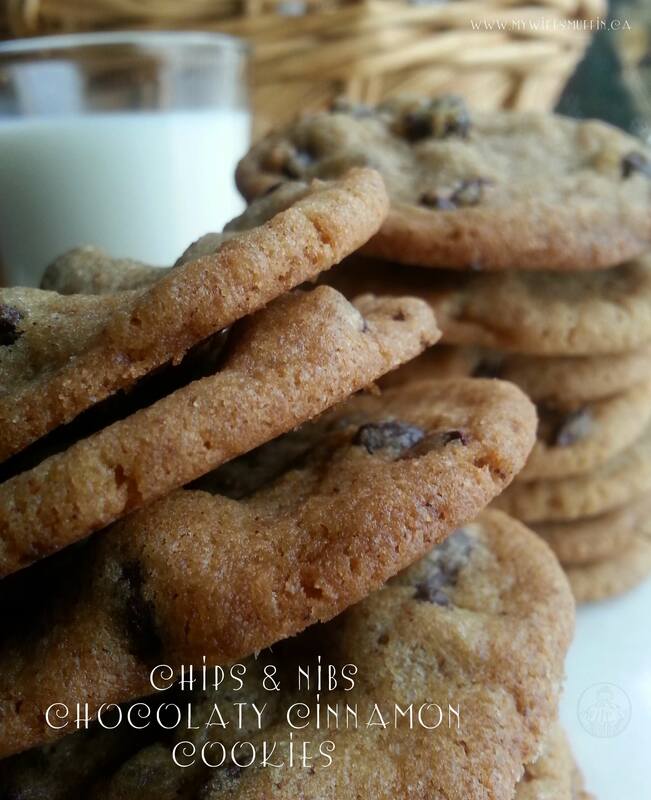 Now back to what we’re really all here for, my wife’s Chips & Nibs Chocolaty Cinnamon Cookies. This recipe may be familiar to some of our long time readers. We adapted one of our very first recipes because it’s that good – and we published that recipe early on… when we had no clue what we were doing in our new food blogging adventure. Heck, we didn’t even have a photo of the original recipe, so it was time for a makeover. Mae decided to up the ante on these cinnamon cookies. We’re big fans of cinnamon and chocolate flavour combinations, so she added some dark chocolate chips and some raw carob nibs. Now if you don’t have carob nibs on hand, you can make these with just the chocolate chips. If you want to maintain the texture of these cookies, try replacing the carob nibs with your favourite nut. Raw carob nibs have a very bitter flavour and crunchy-like texture, so they can be a great substitute for nuts in sweeter baked goods. 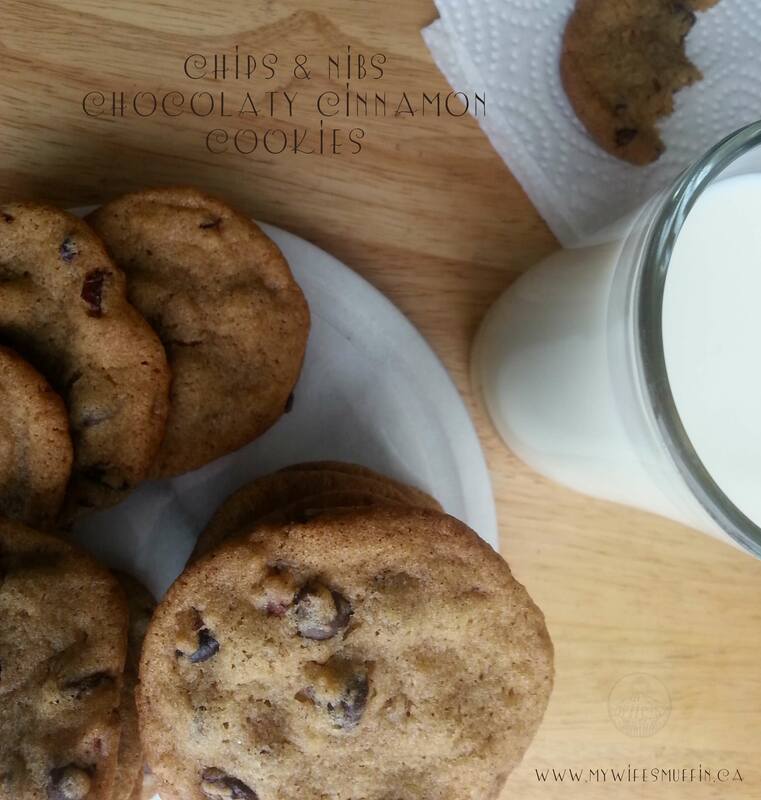 Now Mae made these Chips & Nibs Chocolaty Cinnamon Cookies while I was travelling for work. There were only a few cookies left when I returned, so I knew they had to be good. 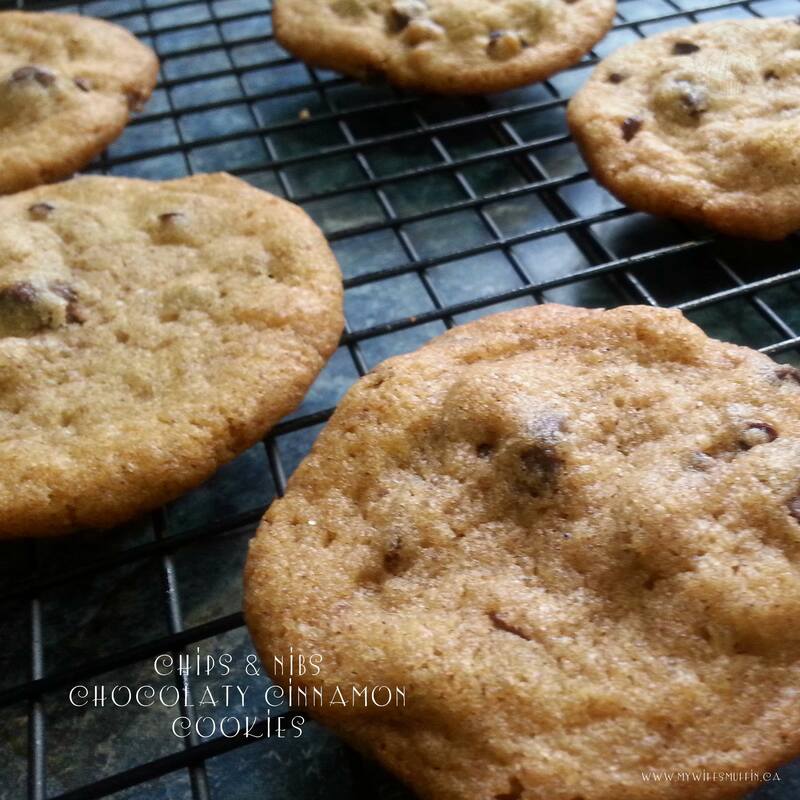 Stored in an airtight container, these cookies were still crispy and chewy a few days later. I’m very familiar with the base of this recipe, as Mae has been making it for years for me because they are hands down, my favourite cookies. The addition of chocolate chips and carob nibs was an awesome idea because the cookies now had a great crunchy texture and delicious chocolate bites, all intermingled with subtle hints of cinnamon. Delicious! In bowl of a stand mixer, cream butter. Add sugar and process until light and creamy. Mix in slightly beaten egg and molasses until thoroughly combined. In a separate bowl, combine flour, baking soda, cinnamon, and salt. In batches, add flour mixture to wet ingredients, blending between each addition. Once thoroughly combined, stir in chocolate chips and carob nibs. Drop by rounded teaspoon full onto ungreased cookie sheet. Remove from oven and allow to sit for 2 minutes before transferring cookies to wire rack.